Mileage allowance: 1 kilometre at a reduced price! Which type of electric fence tape is the right one for me? What role does electric fence tape play? 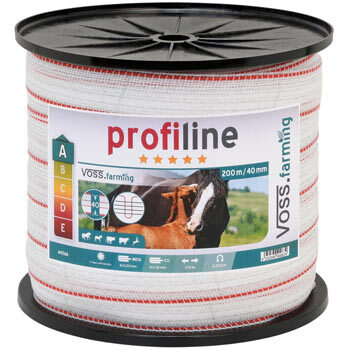 What characterises high-quality electric fence tape? 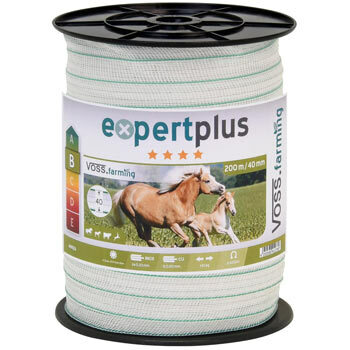 For which animals should the different types of electric fence tape be used? Which accessories are required for the different types of electric fence tape? 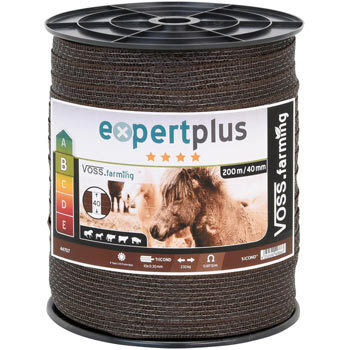 The conducting material plays an important role, enabling the electric fence to function to an optimum. 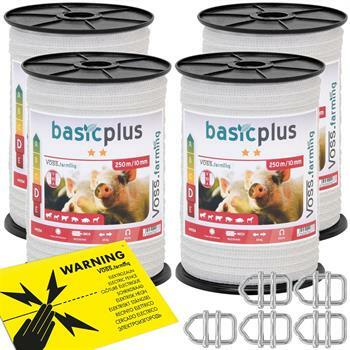 Together with other components such as electric fence posts, electric fence insulators and energisers, the conducting material ensures that animals are securely enclosed out in the field, or pets are kept safe in the garden. Which animals do you want to protect, how should they be protected and what should they be protected from? What type of electric fence is used? 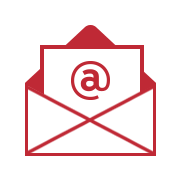 Which external influences is the conducting material exposed to? Which conducting material has the best material properties? How is the conducting material used for the electric fence? 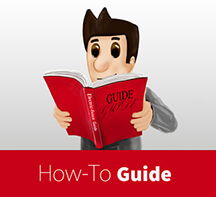 Answers to these frequently asked questions are given below, together with tips and tricks revolving around the subject of conducting material. 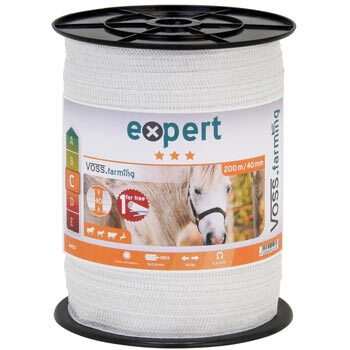 Here, we are focused on electric fence tape which, along with electric fence rope and electric fence polywire, ranks among the most tried and tested conducting materials. Electric fence tape is popular and commonly used, along with electric fence rope and electric fence polywire. The conductors in the electric fence tape are generally arranged in parallel and woven into the plastic material. Electric fence tape can be found in practically all fences such as permanent fences or mobile fences. Electric fence tape is often used instead of rope with inter-woven wires, particularly in the case of stationary horse and cattle farming. The success or failure of an electric fence depends largely on the conducting material. This is responsible for conducting electricity or shock strength and represents a major safety factor Therefore, the following applies: The higher the electric fence tape’s conductivity, the easier it is to electrify the fence. Resistance is measured in ohms. The smaller the number per meter, the higher the ability to conduct electricity. 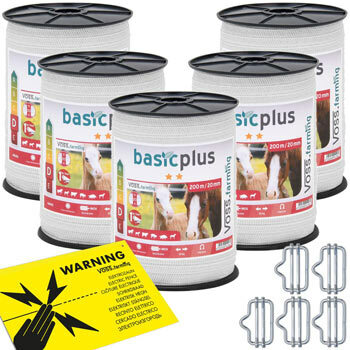 Information about electric fence tape available from the online shop includes length, width and tensile strength in kilograms which should be as high as possible. The length of the entire fence and exactly how the electric fence tape is used have a role to play where conductivity is concerned. One application area of up to 1,000 or 2,000 m, is often split into sections of up to 4,000 m or even over 10,000 m. In the case of a multi-stranded electric fence, the conducting material is joined together at regular distances by means of connection material and connectors. 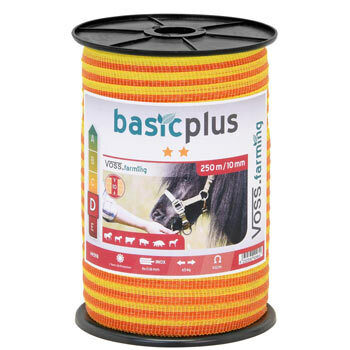 For further information, refer to the descriptions of accessories for electric fence tape. The different sized widths of the electric fence tape are immediately apparent. 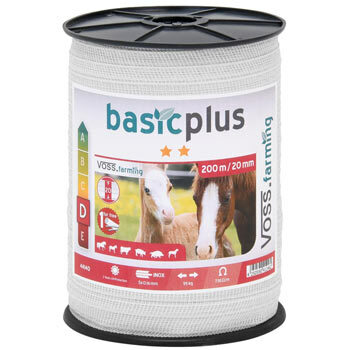 A common measure for fencing tape is, for example, 10 mm followed by 20 mm to 40 mm, whereby smaller fencing tape of 7 mm, or even 60 mm too, is also recommended for smaller enclosures for dogs or cats. 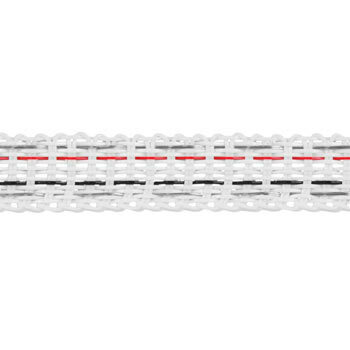 The more conductors the fencing tape contains, the more secure the current flow. Therefore certain types of tape feature bundled conductors made of stainless steel, copper or other alloys such as highly conductive TLD. As regards the carrier material, electric fence tape with polyethylene monofilaments is often used. 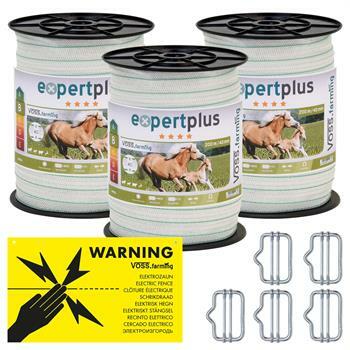 Electric fence tape is tough and ideally equipped to withstand the influence of weather. Plastic made from PE-monofilaments promises long durability. This is even more the case when the monofilaments are specially reinforced. The combination of conductors is therefore the central element of the electric fence tape. 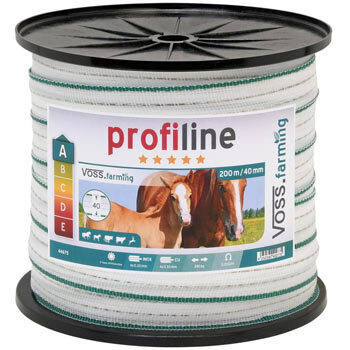 In addition to durability, another important factor must also be taken into account prior to purchase: The electric fence tape should not only be conductive, it should also be hard-wearing. After all, it will be used out in the open where it will be exposed to a variety of weather conditions. Therefore, UV stability is of particular importance. For several hours each day, electric fence tape is exposed to the potentially damaging rays of sunlight. Therefore, it is important that the material (plastic) is able to withstand direct sunlight in the long term. Not to mention rain which also has a damaging effect on the fence tape. Electric fence tape is also damaged by moisture, cold, frost, temperature fluctuations and strong winds. For this reason, it is worth investing in a high-quality, weather-resistant branded product. 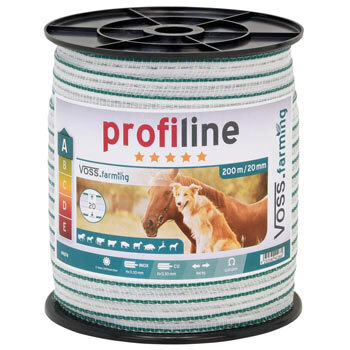 It is a strong advantage if the electric fence tape not only offers outstanding UV resistance, but also has sufficient flexural strength and is able to withstand high breaking loads. 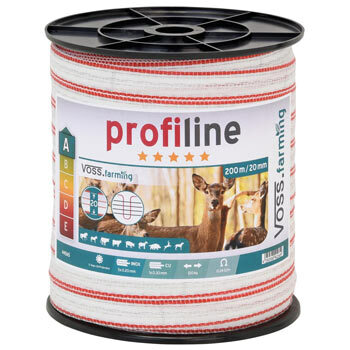 Quality products, particularly electric fence tape with reinforced outer edges, are distinguished by excellent tensile strength. When the electric fence tape is permanently re-electrified there is an uninterrupted, constant current flow. A high degree of safety is only ensured when the fence is supplied with sufficient electricity. Therefore, please take into account our recommendations mentioned in the Electric fence tape section. In principle, for enclosing horses, it is possible to mount the conducting material at a height of 1.2 to 1.4 m and then again at 80 cm lower. Protective fences for cows are effective at a height of approx. 1 m. For large game, several rows arranged close to each other are necessary. 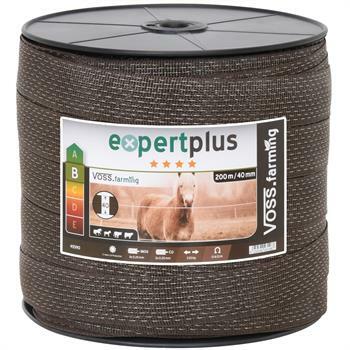 The same is recommended for electric fences for cows, sheep and goats. If you wish to protect small game or small animals with an electric fence, low mounting heights of just 15 or 25 to 50 cm are required. Depending on the breed, a fence for dogs should be about 80 cm high, whereas a garden perimeter fence for enclosing cats should be more or less 1 m high. In the case of an electric fence for poultry, the height of the electric fence tape depends on the height at which the poultry can fly. Ultimately, all these aspects are determined by the fact that if you decide to buy electric fence posts, the height at which the plastic tape should be mounted depends on the purpose behind the protection. It is not just the height of the fence wire that matters, but also the distance between the posts. If you use thin electric fence tape (10–20 mm), an average distance of 5 m is recommended. 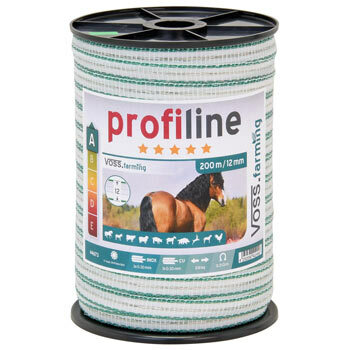 If the conducting tape is 40 mm broad, a post distance of between 3 and 5 m is recommended. Attention should also be paid to the fact that tension insulators will be used at regular intervals to attach the electric fence tape and reduce “fluttering in the wind”. This constant movement in particular exposes the tape to high stress which can ultimately cause the material to break. If this is taken into account, you will achieve considerably improved durability. Of course it looks as though there is a wide range of many different types of electric fence tape. 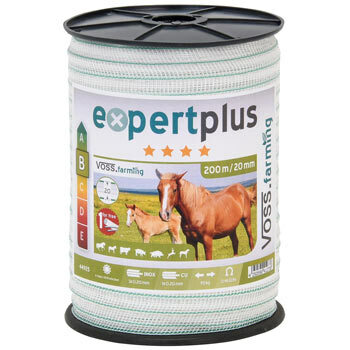 However, by following our tips and product recommendations, you will soon be able to find the right electric fence tape to suit your purposes. 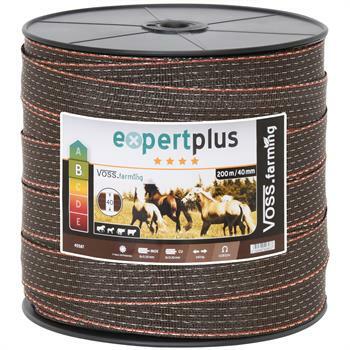 We have already thought of the many points that need to be considered before choosing the right electric fence tape. They are always shown directly next to the electric fence tape. In addition, there is generally a choice between tapes of different widths and lengths. 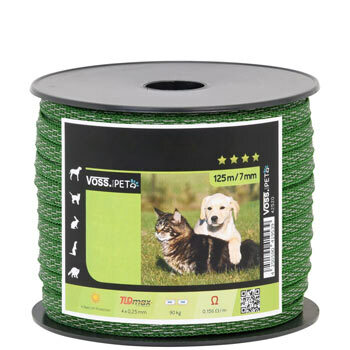 On long enclosures out in the field, electric fence tape is, for example, a possible alternative to electric fence rope, whereas thin electric fence tape is suitable, for example, for use as garden fencing to protect pets. Of course, the tape should be tensioned sufficiently so that it can withstand the high wind loads to which it is exposed. It is also important that your own conductor resistance is not too high. Particularly in the case of long fencing, this is an important factor to take into account. Therefore, pay attention to the specified ohm number. The lower it is, the better the material’s conductivity. You should then also bear in mind the fact that you are using fence tape connectors so that you avoid unnecessarily increasing the electric resistance on the transitions. Finally, electric fence tape is also available in various colours. 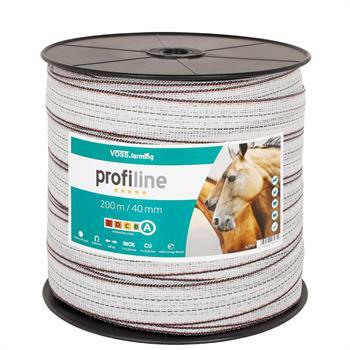 High-contrast fencing tape is preferable as it is clearly visible for the animals. This effect is regularly increased by additional coloured marking on the edges. 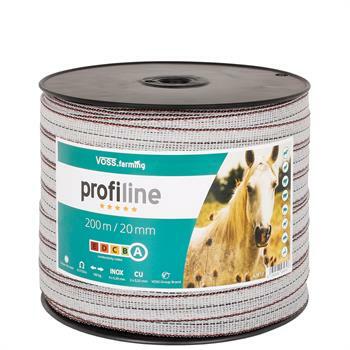 This distinctive feature enhances the visibility of the fence and, together with conditioning the animal by giving it an electric shock, helps make the electric fence tape an effective barrier. Depending on the area of application, you may wish to opt for a discreet green colour. In landscape design or nature conservation areas this colour is essential and consequently mandatory. The amount of tape required depends on the circumference of the area to be enclosed and the recommended number of rows of tape. It is often forgotten that several rows are required. 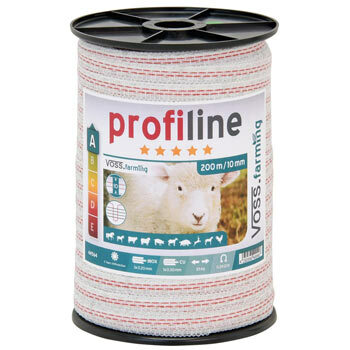 So when choosing your electric fence tape, bear the number of rows in mind so that you buy the right length of tape. Which electric fence tape accessories do I need? 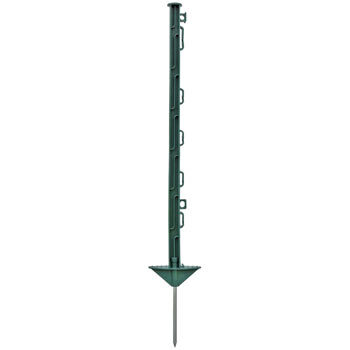 When erecting an electric fence in the field, the electric fence posts must first be placed in the ground at reasonable distances apart. Insulators are then tightly screwed onto the posts. Finally, the electric fence tape is attached and tensioned. 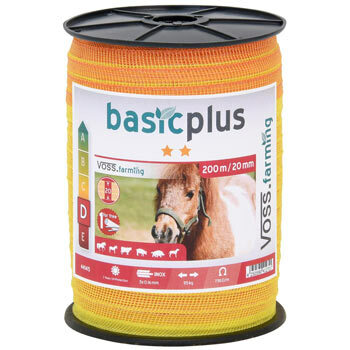 The use of electric fence tape also requires the use of certain indispensable accessories. In order to enable the conductor tape to reliably fulfil its purpose, the following products are required to connect and tension the tape. Insulators are essential for attaching the electric fence tape. We recommend the multifunctional versions. Corner / tension insulators are suitable for attaching the tape to gates and corner posts. They also act as connection plates for mounting polywire and tape. 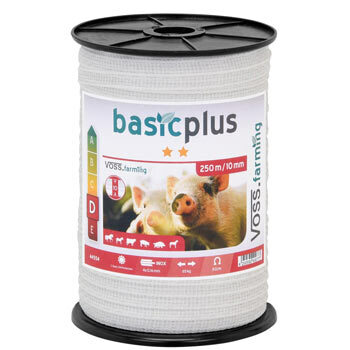 Re-tensioning is easy with the right type of electric fence tape insulator. These have various purposes such as providing a cross-connection between the cable and the fencing tape, or can be used as a 3-way tape insulator, an insulator with a gate connection, a corner insulator, a line insulator or a beginning insulator. Branching points are easily created on the electric fence. It is important that the fencing tape insulator is able to withstand the tape’s tensile force. Tape connectors are essential for ensuring uninterrupted current transmission. Connectors are generally made of metal such as galvanised iron or aluminium, and look like belt buckles. 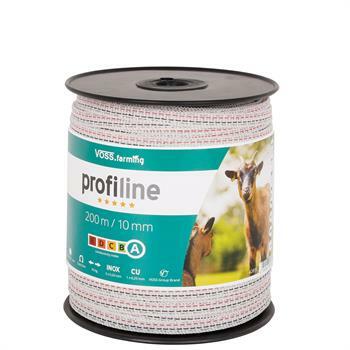 They are used to connect tape together and come in various strengths for electric fence tape ranging from 7 mm to 60 mm. Connection material and connectors are essential for ensuring an undisturbed, uninterrupted flow of electricity. never tie two ends of conductor tape together to connect them. This could cause a failure in the flow of current. Always use a connector appropriately. This will ensure that all wires maintain contact and that the required voltage is maintained. Tied tape also represents a safety risk. Therefore, you should always use connectors for electric fence tape. Alternatively, you could opt for a stainless steel tape connector plate. This is used to connect and easily re-tension electric fence tape. Thus, one row of electric fence tape can be connected vertically to another row of tape. If necessary, gate handles can be mounted to practical tape connection plates. It is possible to connect the energiser directly to the connection plate. This also provides an electrically secure bridge to the gate handle insulator or the gate handle itself. A tape tensioner can be used to ensure that the tape remains sufficiently taught and does not wear out, thus posing a security risk. If the electric fence tape sags, it can be easily tightened by the tape tensioner with a few simple movements of the hand. If necessary, it can also be used to loosen the fence tape. When erecting and possibly repairing or adjusting the electric fence, tape tensioners are useful devices for achieving stability and maintaining safety while keeping both hands free. If you wish to connect two electric fence tapes arranged one above the other, you should consider purchasing a tape connector with two screw plates. 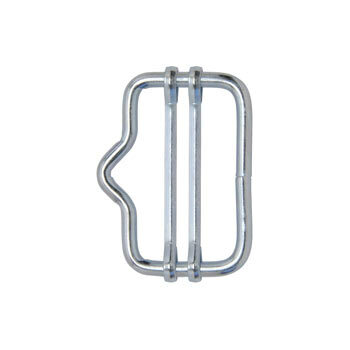 Gate handles, connectors, tensioners, fence and lead out cables for electric fence tape are not just mere accessories but essential elements for ensuring a secure fence. They are inextricably linked to the fence tape and all these elements should be thought of as a single unit in which every detail must be just right. 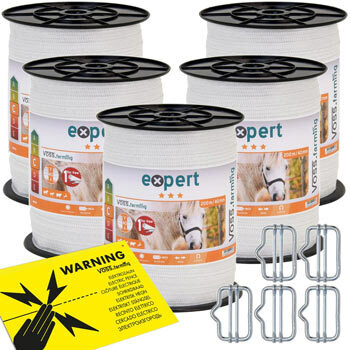 Electric fence tape is a conducting material that is well suited for use with both electric fences and pet fences. Thanks to its width, it is considerably easier to see and is therefore ideal as a visual deterrent and for enhancing the protective effect of the enclosure. Reliable, high-performance conducting material should be chosen for the electric fence so that it ensures optimal visibility and fulfils its purpose in the long term. Factors such as conductivity, resistance to the effects of the weather and tensile strength all play an important role. Therefore, please consider our recommendations concerning the respective types of electric fence tape. To ensure optimum safety, the electric fence tape should be combined with the right accessories such as insulators and connectors. When this is taken into account, high-quality electric fence tape, which is an important element, will ensure the success of the electric fence.